Below is a sampling of updates from the March 2016 Economics Newsletter. To read the full newsletter, click on the thumbnail to the right. The Economics Alumni Network Committee provides connections among alumni and between the alumni and the faculty and current students. This year, Richard Brown, PhD ’94, and Feno Rakotondrazaka, MA ’04, MPhil ’08, have taken over from Stuart Harshbarger, MPhil ’93, PhD ’94, as co-chairs of the committee. The committee is working on a number of new initiatives. This spring, we continue the tradition of presenting a lecture by an economics alumnus/a. This semester’s GW Alumni Lecture Series in Economics will be given by Dr. Chris Varvaras, BA ’77, senior managing director and co-founder of Macroeconomic Advisors, one of the largest macroeconomic forecasters in the United States. The alumni reception and lecture will be held on Monday, April 18, 2016 in Room 213 of 1957 E Street N.W. Register for the event. Photo: Nela Richardson delivers Economics Alumni Committee Lecture. Special thanks to Stuart Harshbarger, MPhil ’93, PhD ’94, for being the founding chair of the Alumni Committee and for taking on the role of chair of our Philanthropy Committee. He also is working on gathering economics alumni in the New York City metro area. If you are interested in getting connected with Stuart, please email him at [email protected]. Because the funding that Marsh & McLennan most generously provided for the reception before the lecture expired this fall, the committee needed to find additional funding. Stuart has generously agreed to supply support that will guarantee the lecture series continues over the next several years. This generosity is greatly appreciated by all alumni and faculty who value these events as a time to remember the bonds that unit all GW economics alumni. The Alumni Network Committee has also set up a GW Economics Alumni Group on LinkedIn. The purpose of the GW Economics Alumni Group on LinkedIn is to unite GW economics alumni from all corners of the globe. So whether you earned a BA, BS, MA, Applied MA, MS or PhD, this group welcomes you to enjoy the opportunity to engage with your fellow alumni. This is also a good way to locate alumni in your neighborhood. Group members are encouraged to post economics related events, discussion topics, personal news and particularly job opportunities. Current students interested in the group will be invited to join after graduation. To join the group, follow this link and click the “Request to Join” button. Finally, the Alumni Committee and Department has resumed a tradition of having a GW Economics Department Reception at the ASSA Meetings. This year’s meetings were in San Francisco and the reception was great fun because faculty could meet with alumni who were there for the meetings and others working in the Bay area. Save the Date: January, 2017, the ASSA Meetings will be in Chicago. Look for the GW Department of Economics Reception! Interest in studying economics at GW continues to grow! There are several ways to measure major popularity. As Table 1 below shows, there has been a substantial increase in economics majors at the May graduation. It is also possible to count declared majors as in Figure 1 below. The decline for all majors between 2015 and 2016 is due to the time of year (February versus May) when majors are still being declared. Furthermore economics currently has 78 majors who are in SEAS, or SB and are not included in the CCAS + ESIA totals. At this point, it seems only a matter of time until economics is number one at GW. Each fall, Professor Anthony Yezer presents the HoGWarts Award to the student getting the highest final exam grade in his large Econ 1011 lecture. This year’s winner was Heidi Schwenk. The department inaugurated the Master's Program in Applied Economics in the fall of 2015 with a class of nine students. More than a dozen students joined the program in the spring, bringing enrollment to 24 students in the program's first year. Students are about evenly mixed between domestic and international locations and about one-third of the students have significant work experience. Demand for the applied economics degree is strong, with more than 100 applications for fall admission in process as of February 1. The program is led by Dr. Joann Weiner, who has been a member of GW's part-time faculty for nearly 10 years. After earning her PhD at Harvard, she joined the Treasury Department where she worked until moving to Brussels for seven years. Professor Joe Cordes co-directs the program. Photo: Professor Weiner (standing) and members of the new Applied MA Program. The faculty has been busy with all manner of academic enterprises. The discussion here simply highlights selected achievements. Professor Jay Shambaugh accepted a position as one of the three senior members of President Obama’s Council of Economic Advisors. This is a great honor for him and for the department. To see his work, go to the CEA website for the pdf of the Annual Report of the Council of Economic Advisers. This is clearly a time in which international trade and finance will keep him busy. In addition to the appointment this fall, Professor Shambaugh also published “Rounding the Corners of the Policy Trilemma: Source of Monetary Policy Autonomy,” in the American Economic Journal: Macroeconomics, (October , 2015) (joint with Michael Klein). Professor Maggie Chen is serving as a trade expert at the Congressional Budget Office. She is examining the economic effects of trade agreements, in particular the Trans-Pacific Partnership (TPP) agreement, on the U.S. economy. Her main task is to conduct an assessment of how TPP would affect U.S. trade, investment, productivity and labor markets. Future CBO reports will convey the results of her research to Congress and the broader policy community. Professors James and Irene Foster are the “power couple” in the department. James’ Oxford University Press book Multidimensional Poverty Measurement and Analysis has just been published. This is a joint work with Sabina Alkire (who has just come to GW from Oxford University), Suman Seth, Maria Emma Santos, Jose Manuel Roche and Paola Ballon. This spring, he became the inaugural recipient of the Michael Brown Research Prize in International Affairs. Professor Foster’s multidimensional poverty measures have been adopted by a number of countries rather than simple measures based on income alone. Irene Foster heads the Department Principles of Economics Committee which has turned teaching of freshmen into a scientific enterprise. She is an expert on economic education and has implemented an elaborate plan of first testing students in basic algebra and geometry needed for principles courses. The testing is accompanied with on-line instruction using ALEKS, which has been specially adapted for this purpose. A subsequent pattern of examination for students failing to pass the examination allows her to associated success in economics with achievement in basic mathematics. Professor Remi Jedwab has distinguished himself early in his career at GW as one of the bright young stars of the department since coming to campus from the Paris School of Economics and the London School of Economics. His main field of research is urban economics but his research has strong ties to development economics, political economy/public economics, trade and environmental economics. His approach is also multidisciplinary. Recently he has collaborated with historians to test hypotheses about the development of European cities over hundreds of years. He has studied urbanization and structural transformation in developing countries, the economic effects of transportation infrastructure and the role of institutions in development. Much of his work has been directed toward Sub-Saharan Africa, an area that has been relatively neglected in the economics literature. In particular, he has documented and explained the phenomenon of urbanization without growth in many of these countries. His research has appeared in the American Economic Review, Economic Journal, Review of Economics and Statistics, Journal of Economic Growth and Journal of Urban Economics. Of special interest to those of you who are located in the D.C. area, Professor Jedwab is the co-founder and co-organizer of the annual World Bank-George Washington University Research Conference on Urbanization and Poverty Reduction. This annual event is regularly attended by large numbers of GW economics faculty, students and alumni. The conference brings together top economists working on the issues of development, urbanization and sustainability. If you have not attended in the past, check for the conference which is held in February. Athletics and economics are seldom encountered in the same sentence. Nevertheless, for members of the classes of 2006 and 2007, they came together as they combined majors in economics with the acrobatics of the GW Cheerleading Team. Carly Urban, BA ’06, and Tom Kennedy, BS ’07, were both members of the team. Photo: GW cheerleading squad at the WWII Memorial on the National Mall. When asked how economics and cheerleading interacted, both Carly and Tom gave almost identical answers. The discipline involved in athletic training applied directly to the study of economics. Concentration, commitment and self-control were required for both. Where are they now? Tom currently works for KPMG’s Government Contracting Service Risk Consulting Practice supporting large aerospace and defense contracting firms. He helps them navigate the federal market place and deal with government review and compliance management. Tom believes that the economics he learned at GW was essential in allowing him to understand the industries in which he operates and communicate with his clients. He has provided a continuing service to the department by participating in the Careers in Economics sessions held for economics majors each September and is currently a master’s degree candidate in a joint program between GW Law and School of Business. Photo: Tom Kennedy in action (foreground). Carly entered the doctoral program in economics at the University of Wisconsin-Madison in 2008 after working at Mellon Bank for two years. She completed the program in only four years and is currently assistant professor of economics at Montana State University. The above photograph of Carly and her MSU colleague is part of an extensive discussion of her research project that can be found here. Carly has already published papers in the Economic Journal, American Journal of Political Science, Journal of Economic Behavior and Organization, Housing Policy Debate, Cityscape, Journal of Consumer Affairs, Journal of Law, Economics and Organization, Papers and Proceedings of the American Economic Association and the Journal of Human Resources. She returned to GW in 2014 to give a department seminar and speak to the Economics Undergraduate Honor Society, ODE. Do you have a suggestion for an item to appear in the “Where are they now” section of the Economics Department Newsletter? Please send your suggestion to Professor Yezer. Cigdem Akin, PhD ’09, is currently working as a public management economist at the South Asia Department of the Asian Development Bank in Manila, Philippines. Vikram Bakhru, BA ’01, went on to medical school at GW and subsequently made his way to surgical residency in Philadelphia. He then completed his MBA from The Wharton School and now works in San Francisco as the chief operating officer for First Opinion. Erik Bergmann, BA ’09, is currently living in D.C., and working in Springfield as a senior consultant at IBM, after leaving The Bureau of Labor Statistic, where he was an economist for six years. Alaska Burr, BS ’09, joined The Core Group at Morgan Stanley as a financial advisor in September 2015. She spent the previous five years on the investment team of a Boston-based hedge fund. Alaska lives in Beacon Hill with her fiancé. Maggie Christenson, BA ’12, is a consultant and Deloitte Consulting LLP in the Federal sector, currently working on a transportation management system implementation. She is also busy planning her wedding for this June and preparing to apply for an MBA next fall. John Creamer, BS ’13, is currently in their second year of a PhD program in economics at Heriot-Watt University in Edinburgh, U.K.
Gerald Croteau, BA ’06, founded American Stonecraft, which just entered its third year of operations. The business adds value to the boulders that “grow” in the soil of New England farms. Its tabletop home accessories are sold in wholesale, in a Boston store and online at AmericanStonecraft.com. W. Thomas Curtis, BA ’81, was recently elected to the Board of Trustees of Maryland Public Television. Holly Firlein, BS ’13, is a first year law student attending University of California, Berkeley School of Law. Robert Frederickson, BA ’04, BS ’04, went to law school after graduation and is now practicing intellectual property litigation at a law firm in Boston. Saira Gallo (Kahn), BA ’08, is the founder of an e-commerce, gourmet cookie company, which uses fair trade ingredients + packaging while having every box support a select charity. The company is located at www.thecookiethatgives.com. James Genuardi, MA ’85, is a senior analyst/economist at Actuarial Research Corporation in Annandale, Va. Their work has focused on evaluating the performance of Medicare demonstration programs conducted by the federal government. He is married and has two sons. Joseph Hanna, BS ’12, is currently pursuing his master’s in economics at UW-Madison. Stuart L. Harshbarger, PhD ’94, continues to work at NERA Economic Consulting and reports that there are now six more—and growing—GW economics alumni working at NERA. Zhaoyang Hou, PhD ’10, is working in Georgetown University School of Foreign Service in Qatar as an assistant professor of economics. Molly Jacobs, MS ’15, PhD ’15, is currently working as an econometric analyst for a boutique firm doing decision model analysis, while concurrently serving as an adjunct econometrics professor at the University of North Carolina at Charlotte as she continues her personal research endeavors. Peter Joyce, BA ’13, is currently teaching middle school math in Bolton, Miss., through Teach for America. Charlene Kalenkoski, BS ’96, MPhil ’99, PhD ’02, is an associate professor in the Department of Personal Financial Planning at Texas Tech University. She also is the co-director of the PhD program in personal financial planning. Alex Kown, BA ’07, is currently manager of Uber Operations and Special Projects for the city of Nashville, Tenn.
Marcelle Little Dawes, BA ’14, is currently a legal assistant in the New York metropolitan area. Alexander Luttmann, BS ’11, worked as an economic consultant from 2011-2014 at The Brattle Group, supporting expert testimony in cases involving antitrust, patent infringement and tax law, but is currently an economics PhD student at UC Irvine concentrating in econometrics. Giovanni Márquez, BA ’92, works in Pakistan with the World Health Organization, as the partnerships officer for polio eradication. Prior to 2014, he was in Haiti, contributing to earthquake, cholera and mass vaccination response activities. Robert Martin, BS ’08, is a fourth year economics PhD student at Michigan State University. His dissertation is on nonlinear panel methods in econometrics, and anticipates finishing next year. He is very thankful to the opportunities and support from GW! Bruce McWilliams, PhD ’05, is currently working as an economist for the U.S. Department of Agriculture where they evaluate the economics and policy behind proposed changes to farm loan programs, including improved credit and risk management tools for agricultural producers. Jeffrey Messina, BS ’13, is currently a senior consultant at Bates White in downtown Washington, D.C., working with expert economists on resolving complex antitrust and liability disputes. <Julio Ortiz, BS ’13, spent two years of working as a research assistant at the Federal Reserve Board in its International Finance division before going back to school full time, pursuing a PhD in economics at Boston University. Rhona Pavis, BA ’64, has been doing research, analysis and writing for most of his career. Edgar Peden, PhD ’87, lives in Frederick, Md., after retiring from the federal Dept. of Health and Human Services where he was an analyst pricing various Medicare procedures. After retiring, Edgar wrote a book on out-of-control health care spending. Fernando Petrassi, MA ’97, works for the government at the International Police Cooperation Service in Rome, Italy, and his first child has a degree in economics. He lost his lovely wife five years ago. Nam Pham, PhD ’97, is currently running a consulting boutique in D.C. to measure economic impacts of public policies and to assess regulatory risk impacts. George Plesko, BA ’80, has been appointed the head of the department of accounting at the University of Connecticut School of Business. Before that, he served as associate dean for graduate programs and research at the school. Solomon Polachek, BA ’67, is the Distinguished Professor of Economics at SUNY (Binghamton) and past president of the Eastern Economic Association. This year his articles appeared in the Journal of Political Economy, Contemporary Economic Policy and Ecological Economics. Aaron Pollon, BS ’14, works as a software developer with TCG, an IT consulting company in D.C., on a contract with the Office of Management and Budget. Troy Quast, BS ’95, began an associate professor position at the University of South Florida College of Public Health in August 2015. Virginia Robano, PhD ’12, is a lecturer in macroeconomics at Sciences Po, while also working for the Directorate for Public Governance and Territorial Development at the OECD, in Paris. Joe Robbins, BA ’07, is a consumer financial services lawyer at Goodwin Procter LLP in D.C., recently married his college girlfriend Francesca and moved to the U Street neighborhood. Brandon Robers, BA ’08, went to work for the federal government after graduation. 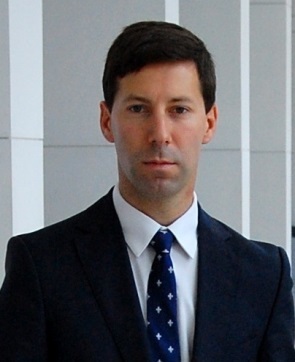 He earned a JD at Georgetown and an MPA at American, and currently serves as a trial attorney at the U.S. Department of Justice and as a reserve officer in the U.S. Coast Guard. Andrea Ruiz, BA ’12, BS ’12, is currently supporting a Miami-Dade County study and plan for predicting impacts of climate change with their Office of Resiliency. She is enrolling in the Master’s in Public Administration- Development Practice at Columbia University in fall of 2016. Rubin Sabharwal, BA ’08, launched several internet ventures after a small stint in banking, but is currently the co-founder of Analyzo.com, a software research engine for startups. He was recently featured on Producthunt. Shawn Sanders, BA ’06, is working as a financial planner in Durham, N.C. Previously he was managing a $150 million portfolio of stocks and bonds and has worked on a national level for consumer financial advocacy campaigns. Currently, he is volunteering in an investment class at UNC Chapel Hill. George Santopietro, BS ’78, completed his PhD at Virginia Tech in 1986 and is now associate dean and professor of economics in the College of Business and Economics at Radford University in Radford, Va.
Akiko Terada-Hagiwara, PhD ’05, has been at Asian Development Bank since 2003. Rosaria Troia, MA ’88, MBA ’96, is a financial economist at the CFTC. After being a research economist at the BEA and World Bank, she also currently serves as the events manager of the GW Economics Alumni Association, and is open to new ideas from alumni. Daniel Uslander, BA ’77, went to work at the Board of Governors of the Federal Reserve System. By late 1980, he was in the commodity futures business, and is still. Daniel has lived and worked in Lower Manhattan since 1989. Alexander Washofsky, BA ’12, is currently a lieutenant junior grade in the Navy, currently serving on USS Arleigh Burke in Norfolk, Va.
Taylor (Eric) Woodbury, BS ’05, is treasurer and a board member of Woodbury Corporation, a family real estate company in Salt Lake City, Utah, and currently works on an enhanced use lease development project at Hill Air Force Base. John Worth, BA ’91, recently joined the National Association of Real Estate Investment Trusts (NAREIT) as senior vice president, research and investor outreach. Prior to joining NAREIT, John was chief economist at the National Credit Union Administration. Murong Xin, MA ’14, is working in a car manufacture company, with headquarters located in McLean, Va., and hopes everyone is doing well! Ellen Young (Beese), MA ’02, is a vice president with Newry Corp., a management consulting firm focused on innovation and growth in Cleveland, Ohio. She is responsible for client projects as well as recruiting.